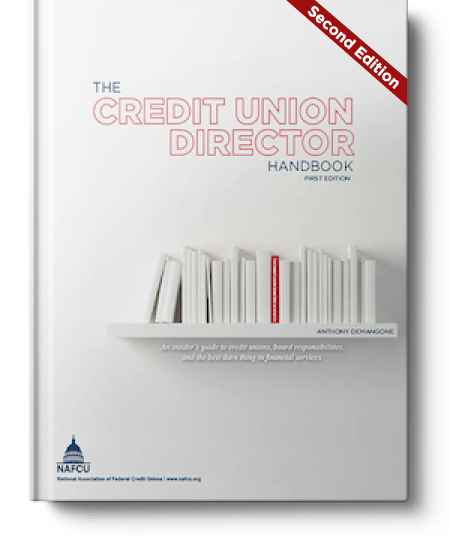 The role of credit union board or committee member usually doesn't come with a job description. Whether new or experienced, as a volunteer leader you can find yourself working through issues without a firm understanding of the rules. NAFCU's Credit Union Director Handbook removes this obstacle. Written by NAFCU's EVP/COO Anthony Demangone, the comprehensive, easy-to-search information gives you the knowledge and confidence to perform your volunteer leadership role to the best of your abilities. Download a Sneak Peek Inside Now! $24.95 Book includes free shipping and PDF version!